EMMA MHIC MHATHÚNA, whose delayed cervical cancer diagnosis was uncovered by the HSE in a recent review has said her tumours have grown. Speaking to Miriam O’Callaghan on RTÉ Radio One today, Mhic Mhathúna, a mother of five children, said that the cancer had spread to her brain. The 37-year-old told O’Callaghan she was “on edge” after the diagnosis. My tumours have become significantly bigger and are now on the left side of my brain. The symptoms will be seizures and loss of speech. She said that due to her Crohn’s disease, treatment options were limited. She added that she had “so many people in the HSE” behind her. Someone asked me the other day am I afraid of dying and I’m not, because I have my faith. But it’s the not knowing and trying to explain to my kids what to do if I have a seizure. I don’t like the unpredictability of it all. I have no control over it – in some ways I just wish it was all over. Mhic Mhathúna said that while she had many people around her, including her family, politicians, the media and the country, she felt “isolated” because she was the one with the disease. Emma also told O’Callaghan that the court settlement doesn’t make her situation better. The €7.5 million doesn’t make any differences to me. I just went in there and I wasn’t taking any nonsense because I wanted my children taken care of – every mouthguard and football boot adds up. She said that what she was going through was “so wrong” and that she hopes no other woman has to face it. It was today revealed that an independent review into over 3,000 cervical smear checks has not yet begun despite it being expected to have been completed by the start of June. Health Minister Simon Harris ordered the review into the National Cervical Check after the scandal revealed that at least 209 women diagnosed with cervical cancer were not told that their smear tests had been incorrectly interpreted. Today, that figure rose to 221. 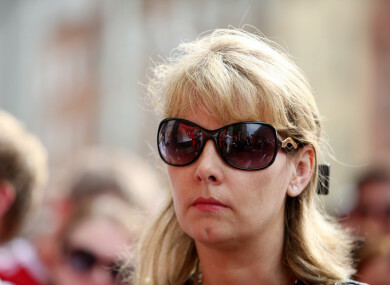 Email “'In some ways I just wish it was all over' - Emma Mhic Mhathúna says cancer has spread to her brain”. Feedback on “'In some ways I just wish it was all over' - Emma Mhic Mhathúna says cancer has spread to her brain”.